Wonderful images of baby ring-tailed lemurs clinging to their mothers’ backs show how the rare primates that hail from Madagascar are flourishing at Chester Zoo. Lemurs are only found in the wild on the Indian Ocean island but face a tenuous future because virtually all of its forests have been destroyed. 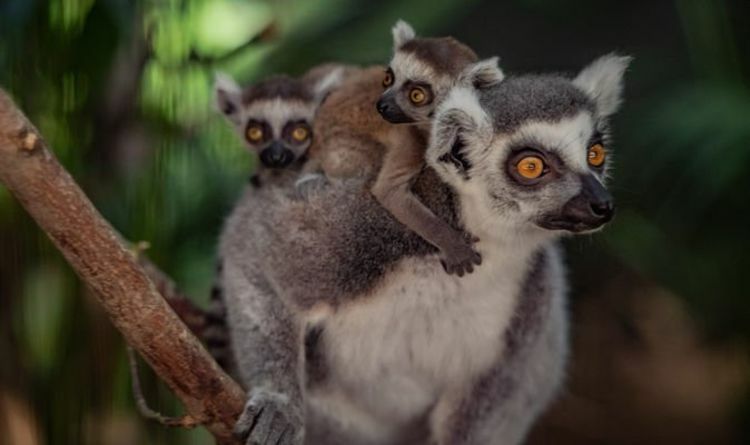 The arrival of five ring-tailed lemurs along with a baby black lemur over the past few weeks in bespoke surroundings at the famous zoo has been a major boost in saving the intelligent but fast-disappearing species, say conservationists. Lemurs have become the planet’s highest conservation priority with more than 90 per cent of Madagascar’s unique forests disappearing. At Chester Zoo, experts have created a 6,000 square metre dry forest habitat to replicate the lemurs’ native haunts on the “living ark” which became detached from the ancient continent of Gondwana 85 million years ago and went on to allow many species to evolve in isolation. The zoo’s Madagascar zone allows visitors to walk through typical forest habitat with more than 1,100 shrubs and 50 trees resplendent with silvery foliage and spines that were specially grown by the zoo’s horticultural experts. It appears the forest conditions are well liked by the resident ring-tailed, black, crowned and critically endangered red ruffed lemurs, with the arrival of six babies so far this year. Dr Nick Davis, Chester Zoo’s Deputy Curator of Mammals, said: “Madagascar is a truly inspirational place; home to incredible, unique wildlife that cannot be found anywhere else on the planet. Yet we can report first-hand that we are on the brink of losing many of these species forever. Conserving Madagascar’s lemurs is urgent and critical. That’s why any birth is important, but to have six rare baby lemurs born within weeks of each other is great news for the breeding programme. When the babies were born they measured less than six inches and weighed the same as a tennis ball, although they bore a striking resemblance to their parents with all the markings on their fur well developed. It is still too early to determine the youngsters’ sexes as they are spending all their time riding piggyback on their mothers. While Chester Zoo has been creating its own Madagascan forest, its conservationists have been involved in habit and species preservation projects on the island, working with field partners Madagasikara Voakajy in the country’s Mangabe New Protected Area.